With a leaked 2.2 build for the DROID X already floating around, Froyo for the DROID X is not a matter of if, but when. Unfortunately, "when" is best answered as "soon." This was the speculation after the leak, but soon has not come nearly soon enough. Given Motorola's very stern warning regarding copyright infringement on the leaked version, the delay is probably owed to Moto patching up the exploits that have allowed the DROID X to be rooted and its bootloader security to be circumvented (à la Birdman and Koush). Regardless of the reason behind Moto's delay in updating the DX to 2.2, it seems Verizon's having trouble containing its excitement over the Froyo jump. This page is straight from VZW's official Droid Does website, which hosts various information regarding updates to Verizon's Android phones. 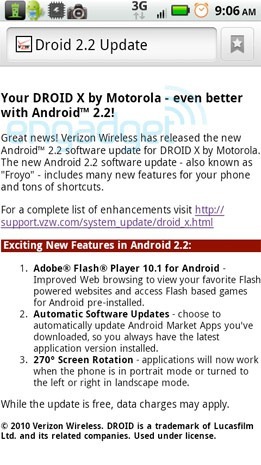 You may notice the slightly inaccurate language of the first sentence on said page - particularly the words "has released the new Android 2.2 ... for DROID X," as in, the past. Barring some sort of time-travel paradox, it seems Verizon jumped the gun on this one. 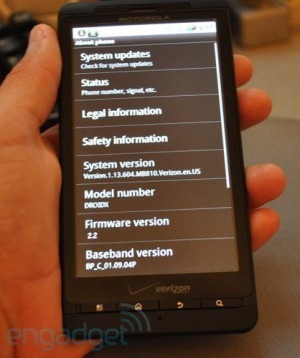 So, does this mean the 2.2 update for the DROID X is coming soon? For now, we'll have to answer with a resounding maybe.